The pilot reported that, during a touch-and-go landing, just after the airplane touched down, he reduced the flaps to 10° and applied full throttle for takeoff. While increasing airspeed, the airplane drifted left. He added right rudder, but the airplane continued to drift left, so he reduced engine power. 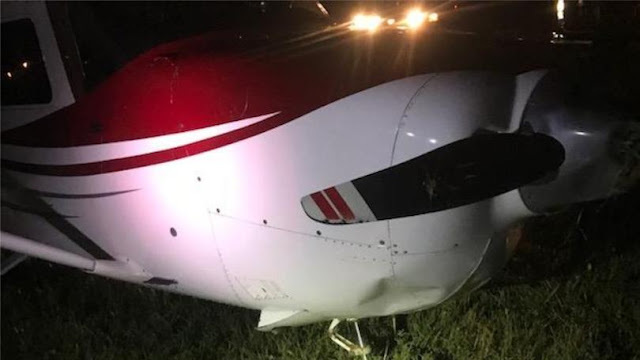 The airplane then exited the left side of the runway, and the pilot briefly applied full throttle to cross a drainage ditch, and the airplane became airborne. Subsequently, when the airplane touched back down, the front landing gear separated from the airframe, and the airplane came to rest nose down. The automated weather observation system at the airport reported that, about the time of the accident, the wind was from 100° at 3 knots. The pilot was performing a touch-and-go landing on runway 24. The pilot's failure to maintain directional control during takeoff with a tailwind. LONDON, Kentucky - London police say no one was injured after a small plane crashed at an airport Monday night. Police say pilot Phil Williams was practicing landing his plane when an unknown failure occurred. The plane left the runway and flipped over in a field. Several units responded to the scene to check on Williams, who was uninjured. The London-Corbin Airport says it is one of the five busiest general aviation airports in Kentucky.